last one was an excellent dancer and I felt as though I were in old Vienna when we whirled around to the Blue Danube, and I mean whirled! 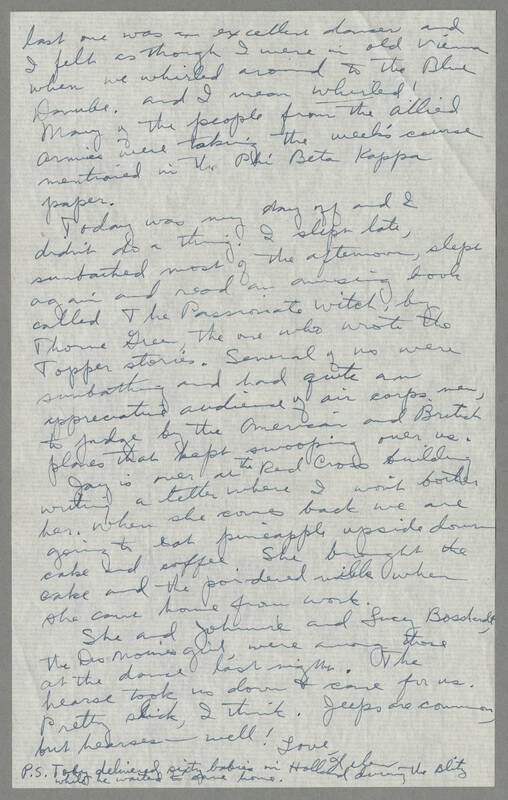 Many of the people from the Allied Armies were taking the week's course mentioned in the Phi Beta Kappa paper. Today was my day off and I didn't do a thing. I slept late, sunbathed most of the afternoon, slept again and read an amusing book called The Passionate Witch, by Thorne Green, the one who wrote the Topper stories. Several of us were sunbathing and had quite an appreciative audience of air corps men, to judge by the American and British planes that kept swooping over us. Jay is over at the Red Cross building writing a letter where I won't bother her. When she comes back we are going to eat pineapple upside down cake and coffee. She brought the cake and the powdered milk when she came home from work. She and Johnnie and Lucy Bosdardt, the Des Moines girl, were among those at the dance last night. The hearse took us down & came for us. Pretty slick, I think. Jeeps are common, but hearses - well! Love Helen P.S. Toby delivered sixty babies in Holland during the Blitz while he waited to come home.